There was a dark side of this progressive nation in the form of child labor which was practised throughout the Victorian period. 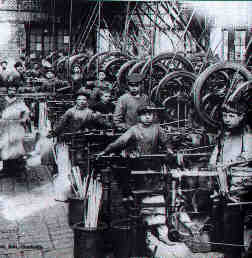 Children as small as three or five year old were employed by industrial units. 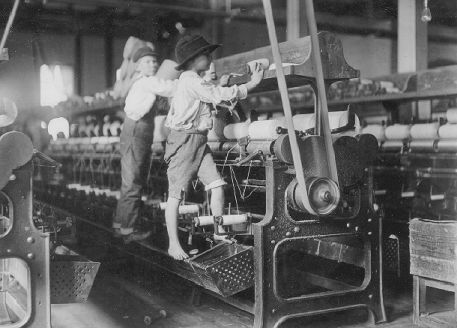 These children were an important source of labor to the industries but despite the hard work, they could be paid a very mere sum. The children worked for long tiring hours in the factories doing hazardous jobs. Children, especially boys around the age of eleven or twelve years were employed to clean chimneys. The basic reason why children were driven to work and jeopardize their lives was because Victorian people lived in large families. The number of people in the family who worked was less as compared to those who were dependent on the earning members. This made it further difficult to earn enough to satisfy everyone’s need. The miserable living condition forced these families to take any opportunity to make money. Thus, children were pushed into working to help the parents to earn money and support the budget of the family. The mindset of those employing these children was that they were helping a needy family by giving work to their children. This attitude exploited the children rather than saving their innocent childhood. The plight of working children was such that they were made to work hard and for a long duration as their parents did. Even the Parliament was in favor of child labor. The conditions in which the children were kept were pathetic. There was little or no clean place to stay, the laborers quarters were poorly built, there was no proper indoor plumbing which resulted in the human waste getting thrown on the streets, etc. The nature of their life was such that all the members of the family spent their entire day toiling in the factory. The only time they saw one another or interacted was to eat or sleep. Again many families would live in a single room to have shelter on their head. The working pattern also disrupted the traditional Victorian family structure where the mother or wife looked after the household chores and children while the men in the family were out working to earn a living. After working for such long hours, there was no time for these children to go to school and obtain the education. This reduced the very importance of education from their lives. The tendency of people had become such that they wanted to earn money by doing any job. In 1840, only twenty percent of the children went to school. However, in 1870, Education Act made it mandatory for children between five to ten years of age to go to school. It was not until 1881 that the Act was made applicable throughout the country. Many children took after school jobs to help manage the budget of their families. There were two common indoor jobs that children took- one was to work as a servant and the other was to be a sweetshop workers. Girls and Boys as young as eleven years worked as servants in people’s homes doing the allotted jobs. There were strict rules which the children were required to follow. Outside job included chimney sweeping and mining. Many young boys were employed to clean the chimneys. Thus, the children were completely exposed to any mishap that may occur during the course of work. There were some businessmen who found the very concept of making a child work in hazardous factories unreasonable. To some, children were appropriate laborers to operate the small machines. In 1802 and 1819, Factories Acts were passed which restricted the working hours of children working in cotton mills to twelve hours. These acts did anything but help improve the situation. In 1833, Royal Commission recommended children between eleven to eighteen years be made to work only for twelve hours, and those younger for eight hours. The problem here was that it only covered the problem of those working in textile industry. It was finally in 1847 that an act was passed which restricted the working hours for both adults and children to ten hours. There was thus optimum exploitation of children in this period.